My skin has gone through some major changes over the past several months. 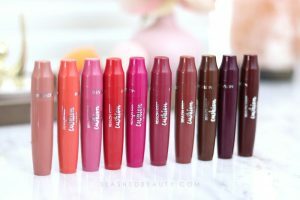 In particular, my problem areas have been more stubborn, and my combination skin has been more combo than ever with aggressive dry patches and an oily t-zone. While I’ve tried more skin care products than I can count on my hands, only the best have made it into my actual daily routines. Since L.A. is seeing a very early spring this year with warmer weather by the day, I knew I needed to start tailoring a new skin care routine for my combination, acne prone skin. Whenever I’m resetting my skin care routine, I start by using the Dove White Beauty Bar to see what I need to add or take away from my current regimen. I did that for about three weeks last month, then started adding products as needed. First thing I noticed: I need a gentle but effective makeup remover. There are so many removers that are way too harsh and leave my skin flaky, but a lot of gentler formulas just don’t get the job done. 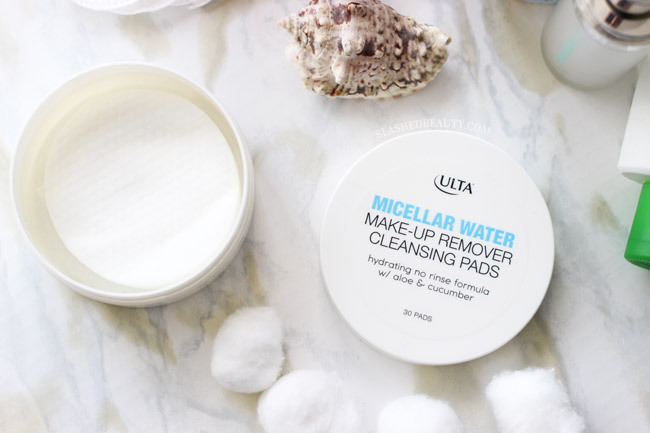 I was really surprised at how well the new Ulta Beauty Micellar Water Make-Up Remover Cleansing Pads worked to cut through my heavy makeup. Since the pads are large and saturated, there’s the perfect amount of surface and product to get everything off. The aloe and cucumber also add a little bit of a moisturizing effect. I need a gentle cleanse morning and night as the foundation of my routine. I’ve been putting a big dent in my Kate Somerville Gentle Daily Wash, which was recommended to me during my Signature Facial when I went to their clinic a few months ago. It’s got a beautiful spa like feel on the face and leaves me clean without stripping. 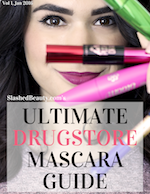 I pair it with the FOREO Luna Mini to get deep into pores and whisk away dirt and oil at the end of the day. 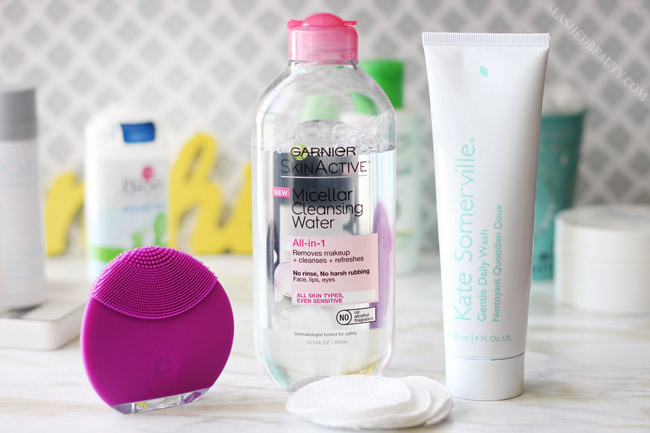 In the morning, I’m only using the new Garnier Micellar Cleansing Water on an exfoliating cotton pad, since I don’t feel that I need anything stronger— only to wipe away any sweat and oil accumulated during the night and start out with a balanced face for makeup. I have two different go-to exfoliants lately, depending on how my skin is feeling that day. If I feel like I need or can handle something a little more intense, I grab the cult favorite Kate Somerville ExfoliKate. Touted as “Hollywoods 2-minute facial,” it uses natural exfoliants to unclog pores, brighten and smooth out my complexion. I use it as a quick mask, letting it sink in for a couple minutes to let the fruit enzymes take effect, and then rinsing off. 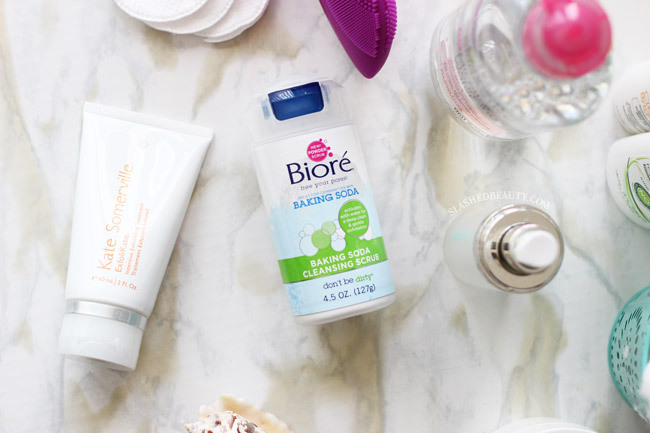 When I need something a little more custom, I use the new Biore Baking Soda Cleansing Scrub, which can be as gentle as you want, depending on how much water you use to activate it. As far as acne treatment goes, I’m still using my Curology (formerly known as Pocketderm) prescription as an all-over face cream. It’s a prescription service that costs about $20/mo for unlimited dermatologist consults and unlimited bottles of prescription topical, like this one I use. It’s specifically formulated for my acne concerns and has been working for over a year now. Join through my link and get one month free! 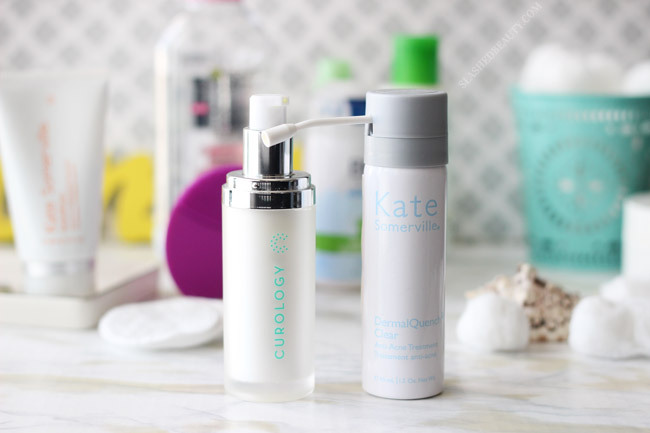 To spot treat, I’m using the Kate Somerville DermalQuench Clear, which is a bubbly foam that helps shrink blemishes quickly. They used it on me during my Signature Facial and it made spots that had been chilling on my face for weeks completely disappear in a couple days. I was sold. As always, I look for lightweight moisturizers with SPF for daytime. 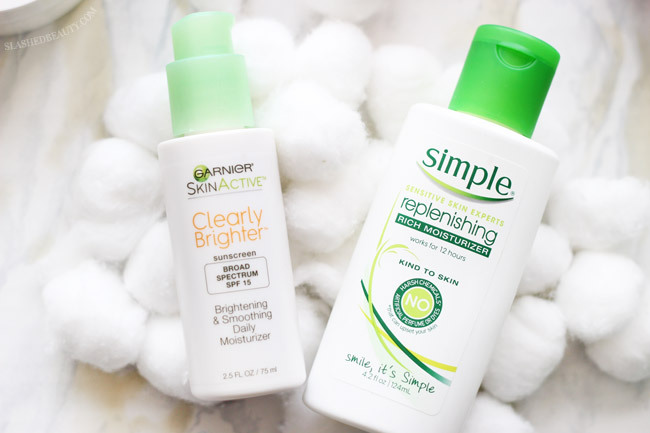 I’m currently loving and using the Garnier Clearly Brighter Brightening & Smoothing Daily Moisturizer, which has a thin consistency but is still moisturizing enough to have my skin feeling great all day. It has a fresh scent that helps wake me up! Since Adam loves running the A/C with fans all night, I typically need something a little more rich at night. I tend to always come back to the Simple Replenishing Rich Moisturizer between testing other products, because while it’s super replenishing, it also doesn’t make me feel like I’m wearing a heavy layer of product to bed. With this routine, my acne has been tamed to about 10% of what it was even a month ago, and my skin has felt way more balanced across the board. While it seems like a lot, I’m willing to take the extra time if it means my skin looks clear, radiant and provides a great base for my makeup. Have you changed anything in your skin care routine lately? 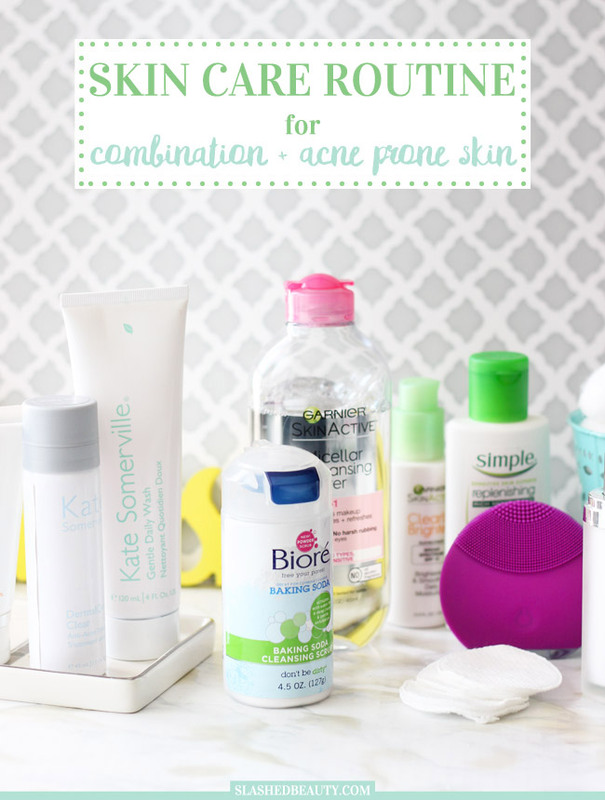 My skin has been very acne prone ever since I hit my early teens. Then it was mainly puberty that was causing the issue. Now (years later) I’m pretty sure my breakouts are hormone-related so there is only so much I can do. But exfoliating definitely helps! Yeah, I think my acne is a mix of hormones as well as diet. I can always tell when I haven’t been eating right when I start getting crazy forehead acne! Have you thought about taking probotics for your skin? I started taking them for my stomach issues and it help clear up my skin while helping with my IBS. I would recommend Align. Expensive but worth it.